The dry summer has revealed the footprint of part of the Castle in the Demesne and created widespread interest locally and in the media. Some of the historical records quoted are in my opinion inaccurate. So I have decided to share a section of my forthcoming book, Finding Footprints, to help in the current interest. A hundred years ago the little town of Moira presented to the eye of a stranger something extraordinarily interesting. It consisted of one long street, each side of which was ornamented by a regular row of lime trees. Just where the houses terminated, at the lower end of town, were two gates exactly opposite. Each gate opened into a long avenue of tall trees; each avenue led to a noble edifice. One was the Parish Church, the other the Castle of the Earl of Moira; so that from one majestic pile to the other seemed but one continued avenue, with a lovely lawn of green at either end of it. We are grateful to Gabriel Beranger, a noted watercolour artist and antiquarian for his two sketches of the mansion. (Beranger’s images used on the header of this website are by the kind permission of the Royal Irish Academy) Also a portrait of Colonel Sharman in the Ulster Museum gives an illustration of how the house looked in its setting. Mark Bence-Jones in A Guide to Irish Country Houses, uses Beranger’s paintings to describe the building. A large three storey eighteenth centre house with a nine-bay front, consisting of a five-bay centre and a two-bay extension either side. Only the roof of the centre section was visible; the roofs on the side bays were either flat or concealed by the massive cornices with which these bays were surmounted. Pedimented and rusticated doorway; curved end bows. The front was prolonged by single storey wings either side ending in piers with urns. with luxurious fancy upon the vegetable wealth, the horticultural beauty, the botanical attractions and the tasteful and intricate disposition of the gardens and parks of Sir John Rawdon’s demesne. Rev. Andrew Craig was minister in the Presbyterian church between 1778 and 1782. He describes how William Sharman faced the problems of vandalism in his gardens and indicates the presence of sculptures in the formal grounds. During a length of time there were nightly depredations on William Sharman’s property. At last the windows of the Rock House were broken and the statue of Narcissus thrown into the pond. an ancient building on the estate of the Earl of Moira which the Earl got modernised and made a commodious habitation: it is surrounded by a wood, which affords beautiful shady walks; a large lawn extends in front, where sheep are feeding, which is terminated by trees and a small lough eastwards; the rear contains a wood with a large opening fronting the Castle, which forms a fine perspective. On each side of this extensive lawn are shady walks through the wood, terminated to the east by a long oblong piece of water, surrounded by gravel walks where one may enjoy the sun in cold weather. And to the west lies the pleasure and three large kitchen gardens. Miss Sharman got planted and improved and has called it the Pelew. It forms at present a delightful shrubbery with ups and downs, either by steps or slopes and has so many turns and windings, that it appears a labyrinth and contains shady walks and close recesses in which little rural buildings and seats are judiciously placed, with a little wooden bridge to pass a small rill of water. Jassamine, woodbine and many flowering shrubs adorn this charming place. A topographical dictionary of Great Britain and Ireland published 1833 described the town; “The family of Rawdon, Marquess of Hastings, derive the title of Earl from this place and their ancient and noble mansion is adjacent to this town.” But another book published in 1837 says the Moira demesne was still very extensive and well wooded, possessing many large and rare trees, with a noble avenue leading to the site of the Castle, long since demolished. Some sources say the demolition was in the early nineteenth century. Perhaps after Sharman’s death in 1803, the house fell into misuse. Alexander Knox says the house “was taken down after the sale of the property to the late Sir Robert Bateson.” Another book published in 1925 says the “gardens and pleasure grounds (were) restored to pasture. The old demesne is now the property of Mr James Douie, formerly agent to Lord Deramore.” The Handbook for Travellers in Ireland (1854) says of the village, “near it are the remains of the demesne of the former Earls of Moira.” All this seems at odds with the Northern Ireland Heritage Gardens inventory and the Northern Ireland Planning Service, which dates the demolition as happening in 1870. Perhaps the latter refers to demolition of walls or ruins that had been still standing. Some features are visible today and others long gone. There was a number of ponds. The site of long pond is still visible as is a pond on land beside the demesne called the Horse pond. An ice-house once stood in the corner of the demesne beside the path that enters from Torwood. A Hermitage was situated just beyond the furthest end of the demesne but all remains seem to have been obliterated under a farm track. The Dark Walk was a tree-lined avenue, which was cut down apparently by the American Military during World War II. It is a shame so much has been lost but it could have been so very much worse. What is now a beautiful park could easily have become an industrial development! The Ministry of Commerce is interested in Moira Castle Estate as a possible site for industrial development. I notice on the O.S. 6” map, Moira Castle appears in Old English type, with “site of” in brackets underneath and I thought it advisable to enquire if these ruins come under ancient monuments. 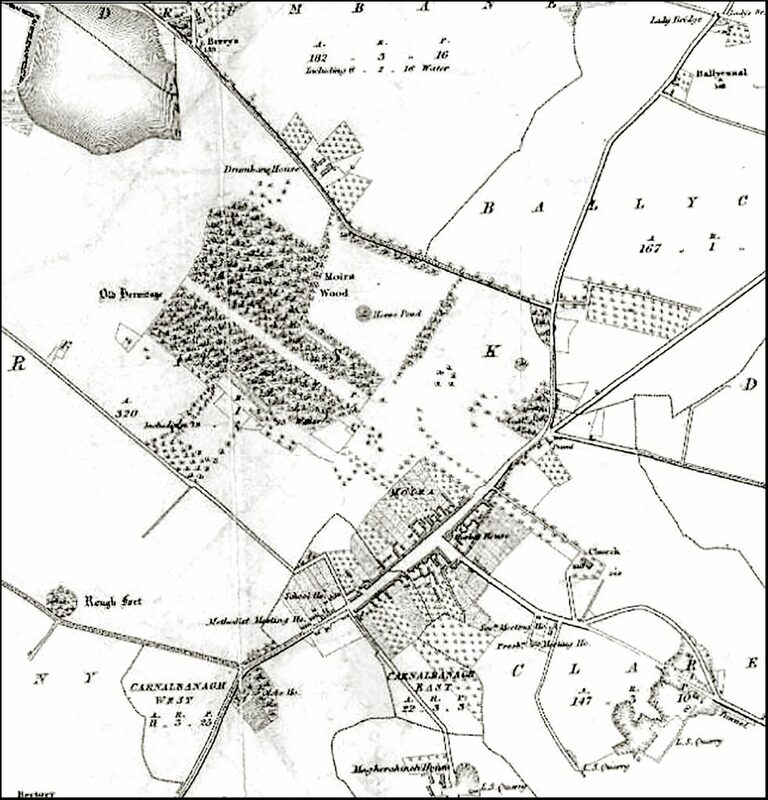 How the house and demesne were used in preparations for the Battle of the Boyne. And how John Wesley preached on the lawn because the clergyman would not allow him into the church. Wesley was always welcomed by the Rawdons even though he quite strongly challenged them about their need of Salvation. Anne Lutton – “A Consecrated Life” 1880. Parliamentary Gazetteer of Ireland 1846. page 781. Ulster Journal of Archaeology, Volume 14 Issues 2-3 Publ. 1808. Beranger’s illustration would appear to depict “the small lough eastwards” behind the wall on the corner of Station Road. In very old maps a shape drawn at that spot almost certainly is the lough. In periods of sustained wet weather that corner of the meadow floods making it easy to believe that the small lough eastwards was probably located there. The Journal of the Royal Historical and Archaeological Association of Ireland. Topographical Dictionary of Ireland. Publ. 1837. McGill Faculty of Education, Montrealhttp://www.mcgill.ca/education. A history of the County of Down by Alexander Knox MD. Publ. 1875 page 396. Dromore, an Ulster Diocese by E.D. Atkinson LLB. Archdeacon of Dromore. Publ. 1925. Northern Ireland sites and Monuments Record. http://appsc.doeni.gov.uk Document SM7-DOW-013-010.pdf.